Gas Prices Still Falling, Except In Midwest. Oil Futures Heading Higher. Gasoline prices across the United States continued their downward slide for the fourth consecutive week this week, according to the latest weekly EIA gas price survey. However, the Midwest bucked the trend of lower gasoline prices, just as happened last week, as reflected in the March 18 survey. The average price for a gallon of gas will set drivers back about $3.68, on average, although the prices are considerably higher on the West Coast of the U.S., where the avarage price for a gallon of regular unleaded is running just under $4.00. The cheapest gas was to be found in the Rocky Mountains the Gulf Coast. In the mountain regions, the price of gas was about $3.47, compared with about $3.50 in states along the Gulf of Mexico. As we reported last week, the Midwest’s trend of higher prices could be an indicator of the coming trends for other U.S. regions, and the continued climb in oil futures prices would tend to lend credence to that argument. The price of oil futures, which spiked in late January and throughout February, drifted very low at the end of February and beginning of March. 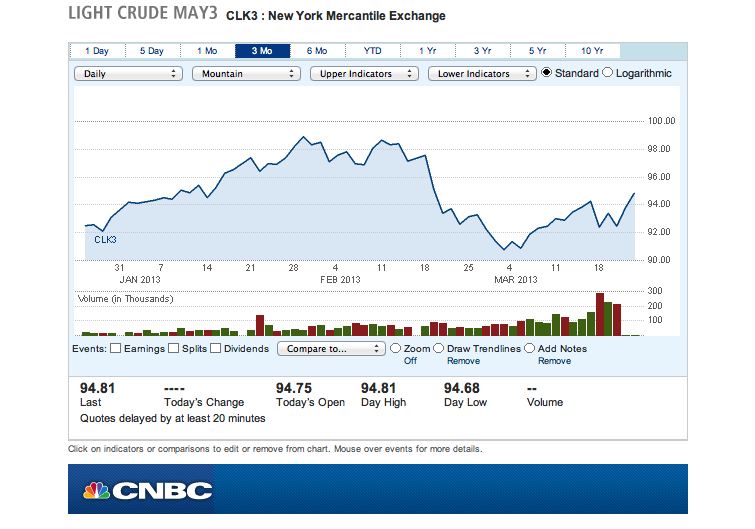 However, for the past two weeks, the price of crude oil has been on the uptick, although prices were unchangted today. However, futures of Brent light sweet crude were up $0.52 today. Crude oil futures took a nosedive in late February, contributing to March’s lower gas prices; however, the futures trades are trending higher again. Chart courtesy of CNBC.com. For truckers, the news was a little better across the board. On average, diesel prices were off by about 4¢ per gallon across the United States, with prices along the Gulf and West Coasts dropping by as much as 6¢ per gallon. Previous Previous post: Three Weeks Is A Charmer! Gas Prices Fall Again, But Is That About To Change?